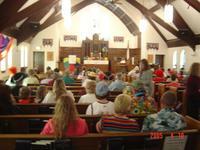 At Wesley United Methodist Church we have two styles of worship which usually alternate weekly. One is simply called the "Blended" service and incorporates more contemporary music with the use of our "Blended Choral Group" to help lead the worship songs.. It is often accompanied with beautiful piano renditions by our talented pianist, Mrs. Dawn Thompson, and also our very talented percussion player, Mr. David Howard. Occaisionally we also have bass guitar supplied by Mr. William Buchwitz. This service usually begins with at least three sinpiration or contemporay music songs and will be a little more simple that the traditional worship service. We often use music from the "The Faith We Sing" supplement to our Hymnal which contains many modern and upbeat contemporary services. Traditional worship in the United Methodsit Church can vary greatly from one church to the next, however, for Wesley Untied Methodsit Church traditional worship oftem means use of our beautiful pipe-augmented organ and hymns which come from our United Methodist Hymnal. Often at least two or three of the lectionary readings for the Sunday are also read. Depending on how the first Sunday of the mornth falls, we may also have a full communion service with sung responses.